After recent MacOs update broke DisplayLink, and there’s not a lot anyone can do about it. 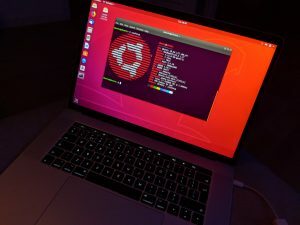 Being the author of displaylink-debian and it working on Linux, I had to do something about Linux having non-installable status on above mentioned MacBook Pro models. I remastered Ubuntu 18.04 (Bionic Beaver) and included all necessary drivers, for reference I used mbp-2016-linux GitHub repo. Out of above mentioned, bluetooth is fixed in 4.17 version of the kernel which is about to be released soon (latest is 4.17-rc5). Suspend/hibernate can be worked around, and I’m hoping sound can also be fixed by time 4.17 final is released. Although it wasn’t my intention to release this image, as it’s not completely finished. I’m planning to do another remaster with kernel 4.17 (once it’s released) and hopefully with everything working out of box. You can simply “burn” this image to a USB drive using i.e Etcher. Once you’re done, reboot your Mac and hold “option” key to show up a boot options. Choose to boot from your USB and enjoy! To find out when new remastered image is released, please follow me on Twitter or Google+. In meantime, please fire away any questions you may have and happy hacking!